The San Fernando Valley company whose mobile advertising trailers parked on city streets provoked a flood of citizen complaints over the past several years has filed a lawsuit in U.S. District Court asking that the city’s ban on the trailers that took effect this year be declared an unconstitutional violation of the company’s free speech rights. The company, Lone Star Security & Video Inc., is seeking both a preliminary and permanent injunction stopping the city from citing the advertising trailers and towing them off the streets if they aren’t removed. The lawsuit filed March 11 also asks for compensatory and punitive damages from the city in unspecified amounts. The combative head of the company, Bruce Boyer, publicly threatened to sue the city for millions in damages after it enacted the ban on Jan. 1 of this year. The city’s action came after the California legislature last year passed a law giving cities and other local jurisdictions the authority the ban the advertising trailers that many consider nuisances because of they create visual blight, occupy needed parking spaces, and are potential traffic hazards. The advertising trailers were most heavily concentrated in the San Fernando Valley, but in the past several years became more common in other areas of the city. 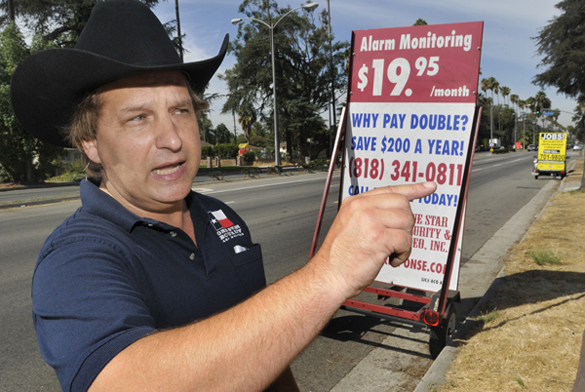 The billboards, almost always advertising small local businesses like computer repair, massage, and dance classes, were typically mounted on wheels, but after the LAPD began citing and towing them the company removed the wheels from at least some of the trailers, apparently as an attempt to circumvent the law. At least one other L.A.-area city is contemplating a ban on the billboards. This week, the Santa Clarita City Council is expected to vote on such a law.